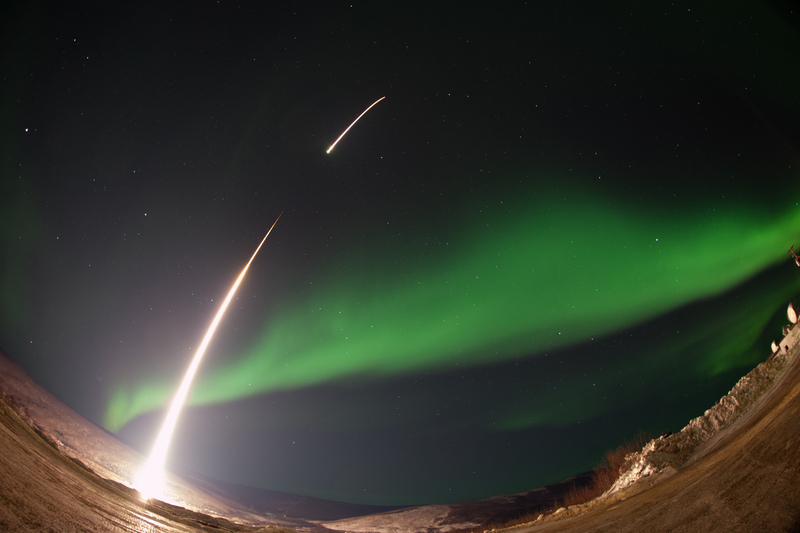 The space agency regularly launches research rockets to monitor space weather — and sometimes those rockets fall into the Beaufort Sea. The U.S. Bureau of Ocean Energy Management recently announced plans to proceed with a 2019 auction of rights to drill oil in the Beaufort Sea, despite ongoing legal challenges to the lease sale. But an unlikely government agency is raising questions about the safety of this plan. In April, Alaska’s Energy Desk reports, NASA outlined its concerns in a letter to BOEM — chiefly, that its rockets sometimes fall into the Beaufort Sea. NASA supports the Poker Flat Research Range, which is operated by the University of Alaska Fairbanks about 30 miles north of Fairbanks. It is the only high-latitude rocket range in the United States and the largest land-based rocket research range in the world. Poker Flat regularly launches rockets to gather information about upper latitudes, such as aurora activity that can affect communications. Poker Flat also performs satellite tracking and manages a growing fleet of unmanned aircraft. But what goes up must come down. And in far northern latitudes, the rockets often land in the water — “almost certainly” in the Beaufort Sea or elsewhere in the Arctic Ocean, says Kathe Rich, director of Poker Flat. NASA Goddard Space Flight Center estimates that 70 rocket parts have landed in the Beaufort Sea in the past six decades. The agency is concerned that developing potential oil and gas fields in the Beaufort Sea could result in safety issues. Rich explained that NASA keeps a huge database of areas, and people, to “protect” when calculating a rocket’s safe trajectory — including homes, villages, trapping and recreational cabins, winter trails, pipelines, mining claims, oil platforms and culturally significant areas. “Those are things that we need to avoid hitting, obviously,” she said. “The more things we need to protect, the fewer launch opportunities we end up having,” Rich explained. If oil drilling is permitted in the Beaufort Sea, they wouldn’t continue launching rockets into that area. That means their ability to conduct research would be much more limited. “We wouldn’t be calling up Shell and saying, ‘Hey, we’re gonna start raining rockets down on your head,’ because that’s not going to happen,” Rich said. Instead, she explained, the research simply wouldn’t take place. It is possible to plan around drilling platforms — if they have accurate information about the range of the infrastructure and the number of people working in a given area. However, Rich said, it’s often hard to get accurate information from companies seeking to protect the privacy of their assets. “Oil companies, just like many businesses — this is perfectly normal, it’s nothing nefarious or anything — they’re hesitant to divulge any information on what exactly they’re doing, and how many people are doing it,” Rich said. “In the absence of information, we have to make some very conservative assumptions.” And when they have to be conservative, that often rules out some research. “That is definitely one of the concerns,” Rich said. The agency did run some safety analyses during Shell’s most recent Beaufort Sea exploration program, but wound up not having any launches in that direction. A much broader lease program in the Beaufort Sea, however, could make avoiding conflicting launches more difficult. The Obama administration placed a freeze on oil exploration in the Alaska portions of the Beaufort and Chukchi seas, but the Trump administration quickly announced plans to reopen almost all of those regions to natural resource exploration. Currently, BOEM is conducting an environmental review of the plan and soliciting feedback. “We especially need to hear from residents of the Beaufort Sea communities, letting us know how the proposed leasing area is currently being used and what specific areas need extra attention,” James J. Kendall, director of BOEM’s Alaska Region, said in a statement. A radius north of Poker Flat is one of those areas. This process might also pave the way for future negotiations. The Trump administration has also made moves to open up the Arctic National Wildlife Refuge to natural resource exploration. “That’s a much more common place for us to want to be impacting things than in the direct North Slope area,” she said. However, Rich isn’t worried about resource exploration affecting research — at least, not yet. “Ultimately, if we were unable to come to some sort of agreement, we would do less research,” she continued. But that scenario is still very far off.